Artas® Hair Transplant is revolutionizing the hair transplant process. Traditionally, if you wanted to restore the thickness of your hair and encourage hair growth, you would be required to endure a lengthy procedure involving stitches and scarring. Known as the Strip Method, this technique actually removes a section of your scalp in order to prepare hair follicles for transplantation. Although the Strip Method is a viable option for some hair transplants, many patients are eligible for Artas® Hair Transplant, a less invasive method of hair restoration which avoids incisions, stitches, and scarring. Artas® Hair Transplant’s innovative, robotic technology selects only the healthiest hairs for transplantation, and it removes those individual follicles without damaging surrounding follicles. This ensures that both the donor area of hair at the back of your head and the transplant area of scalp at the crown of your head both achieve natural results. The doctors and staff at the Jacksonville Hair Restoration Center are the only hair transplant experts in the entire Southeast to offer both NeoGraft® and Artas® Hair Transplant procedures, the most advanced technologies available to restore hair thickness and growth after hair loss. Our hair restoration experts are members of the American Society of Hair Restoration and can determine which hair transplant method best addresses your condition. How does Artas® Hair Transplant select which follicles to transplant? Hair loss is a widespread concern for the majority of men. By age 35, approximately 65% of American men will notice some degree of hair thinning, and by age 50, nearly 85% of all men suffer from significant hair loss. Although balding can begin as early as puberty and be caused by a variety of health and environmental factors, Androgenic Alopecia (male pattern baldness) is the most common cause. This means that your hair follicles are genetically predisposed to be sensitive to the hormone dihydrotestosterone (DHT), and as levels of DHT increase with age, your hair increasingly thins, deteriorates, and eventually, falls out. 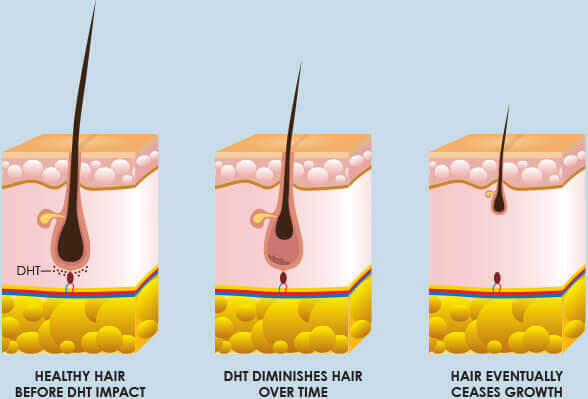 Hair at the sides and back of the head are typically resistant to DHT. This makes those specific follicles ideal for hair transplant because they are genetically predisposed not to fall out. 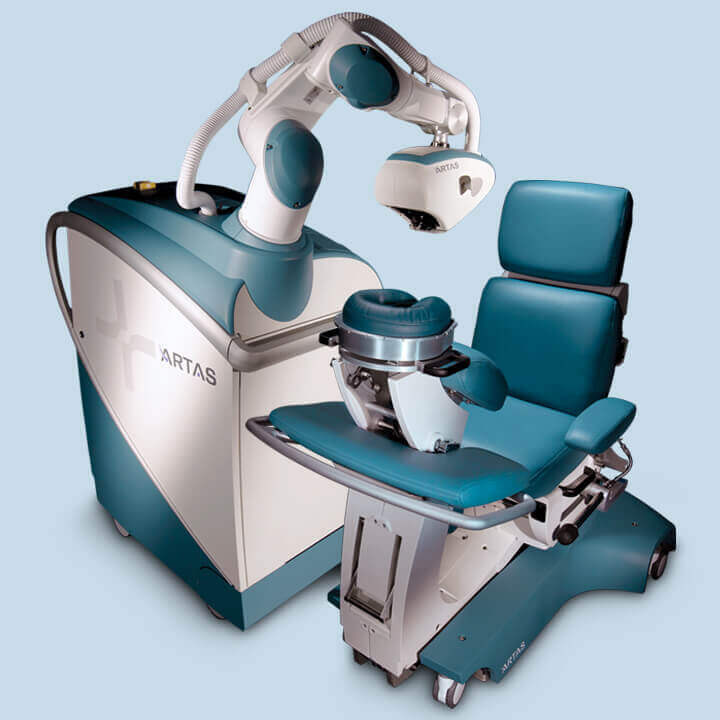 Artas® Hair Transplant’s ground-breaking digital imaging and precision robotics selects only the healthiest hair follicles that haven’t been diminished by DHT for transplantation, ensuring that the transplanted follicles take root and grow in their new location. This method also ensures that the hair at the back of the head remains thick and unscarred because the surrounding hair follicles remain untouched. DONOR AREA** Patients individual results may vary. 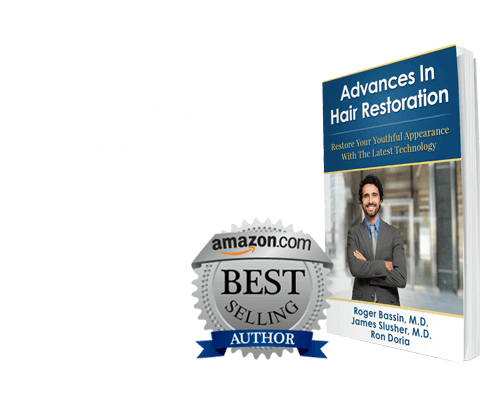 How can I prepare for my Artas® Hair Transplant in Jacksonville? On the day of your Artas® Hair Transplant, the donor hair at the back of your head should be no longer than 1 millimeter. This hair length is very important to ensure that Artas®’ digital imaging and robotic technology can take accurate readings of your follicles. Styling your hair in a short cut also ensures that our hair transplant experts can easily and precisely insert the transplanted follicles in their new location at the crown of your head and hairline. To ease the transition from a longer hair style to the necessary short haircut the day of your procedure, we recommend that you bring the below haircuts to your salon for pre-procedure haircuts over a period of several weeks. In this way, you will feel more comfortable in shorter hairstyles, and friends, family, and co-workers will be less inclined to notice the transition. These scheduled haircuts will also ensure that your hair is the desired length by the day of your Artas® Hair Transplant. Our hair restoration experts can answer any questions that you or your salon may have about the necessary hair length needed for your procedure. What should I expect the day of my Artas® Hair Transplant? On the day of your procedure, you should wear comfortable clothes, a shirt that buttons or zippers in the front, and a loose-fitting hat for your ride home. You will be given a local anesthetic during your procedure, so you will remain awake throughout the transplant process. You are encouraged to bring a book, music, or even work, depending on your preference, to pass the time during your procedure. There will be breaks during which you can eat, stretch your legs, and visit the lavatory if needed. After your Artas® Hair Transplant, our hair restoration experts will give you post-procedural instructions on recovery and home care. Be sure to listen to their instructions and follow them carefully. Many instructions, such as those pertaining to shampooing and cleaning your newly transplanted follicles, are extremely important to the long-term results of your hair transplant. In the weeks following your procedure, your transplanted hair follicles will grow at the rate of normal hair. You will eventually wash, comb, style with products, and cut your hair like you would naturally. BEFORE AND AFTERS** Patients individual results may vary. How do I get started with Artas® Hair Transplant in Jacksonville? The doctors and staff at Jacksonville Hair Restoration Center would be happy to help you set up a private consultation to discuss Artas® Hair Transplant in Jacksonville. Schedule an appointment online or call our Florida location @ 904.996.0030.